Keywords: Multiple fractures, osteomyelitis, osteopetrosis, Rugger Jersy spine. Osteopetrosis is a descriptive term that refers to a group of rare, heritable disorders of the skeleton. Osteopetrotic conditions vary greatly in their presentation and severity, from just as an incidental finding on radiographs to causing life-threatening complications such as bone marrow suppression. A 37-year-old male patient presented with complaints of pain and swelling in the left side of the lower jaw for the past 1 month. The patient developed pain in relation to the left mandibular second molar due to dental caries. Extraction was carried out in a private hospital 6 months back, following which the patient experienced pus and blood discharge from the socket. For the past 1 month, the patient had dull, intermittent pain with subsequent extraoral swelling. The past medical history of the patient revealed that he suffered from multiple fractures from the age of 10 years. Most of these fractures were due to trivial trauma. His eldest brother was mentally challenged and suffered from multiple fractures due to minor trauma and had died at the age of 20 years. On general examination, the patient had a limping gait. Evidence of malunited fractures was noted. Neurological examination revealed no abnormalities. Intraoral examination revealed a reactive growth of 1 cm ×1 cm from the socket in relation to the mandibular left second molar (37) region, with pain on palpation of the buccal vestibule in relation to the first premolar (34) and the second premolar (35) regions. Several permanent teeth were clinically missing [Figure 1]. Considering the positive findings after clinical examination, a working diagnosis of chronic suppurative osteomyelitis was made. The orthopantamograph (OPG) of the patient revealed a crater-like ill-defined, lytic lesion impinging on the neurovascular bundle in the left mandibular molar region. 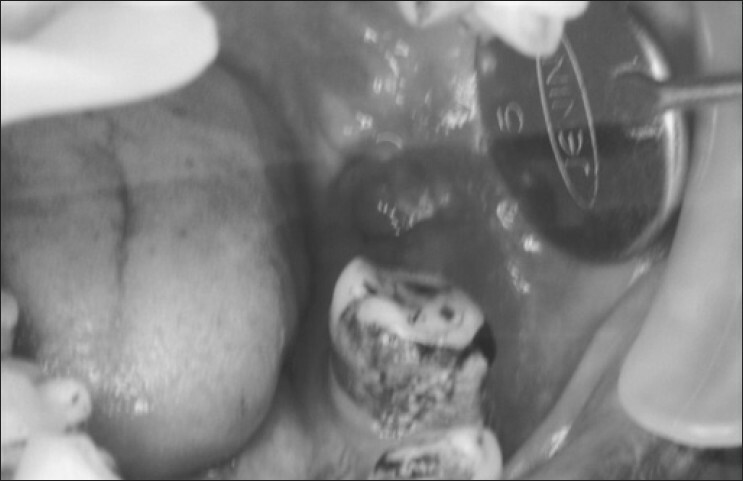 The canine and the second premolar in the third quadrant were impacted. Also, the OPG revealed an overall increase in the density of bone, lack of distinct lamina dura, lack of corticomedullary differentiation and impacted third molars with no root formation [Figure 2]. A skeletal survey was performed because of the clinical findings. The lateral skull view revealed thickening of the inner and outer tables and widening of the diploic space, with a hair-on-end appearance of the cranial vault and sclerosed cranial base [Figure 3]. The antero-posterior view of the pelvis revealed increased density with malunited fractures [Figure 4]. 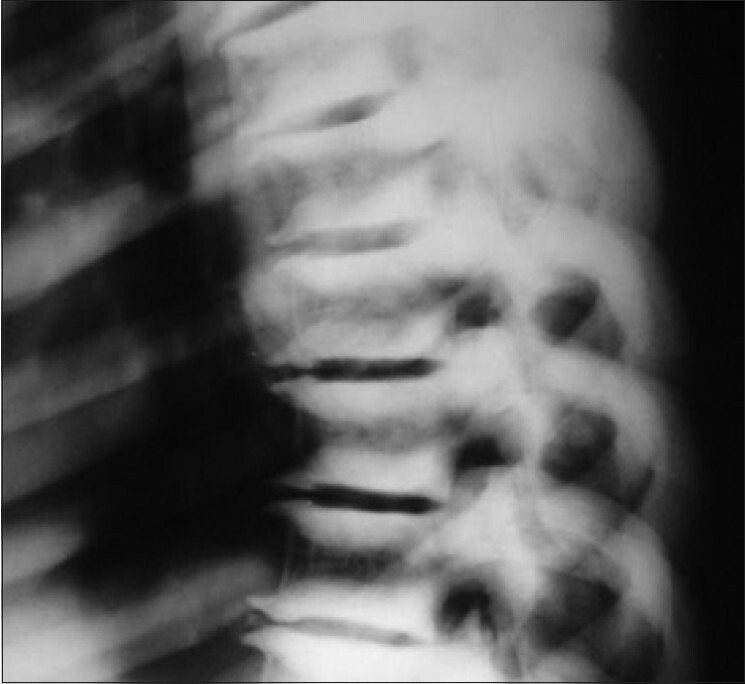 The lateral view of the spine revealed thickening of the end plates with a Rugger Jersy appearance [Figure 5]. Radiographs of the forearm, hand, wrist, femur and the chest revealed diffuse osteosclerosis and malunited fractures [Figure 6]. Hematological investigations revealed a hemoglobin level of 10 gm/dl and an elevated sedimentation rate of 40 mm at the first hour. The peripheral blood smear revealed a microcytic hypochromic picture with anisopoikilocytosis. Serum creatinine, calcium, phosphorus, acid phosphatase and alkaline phosphatase were within normal limits. Considering the history along with the clinical, radiological and laboratory findings, we arrived at a final diagnosis of chronic suppurative osteomyelitis secondary to autosomal-dominant osteopetrosis (ADO). The patient was treated empirically with clindamycin 300 mg intravenously two-times a day for 7 days. The patient improved after 1 week and was transferred to out patient care. Conservative management was favoured due to the risk of fracture of the jaw bones with surgical removal of the impacted teeth. Osteopetrosis usually manifests as two forms: an autosomal-recessive malignant form (osteopetrosis congenita), which occurs in infants and children and an autosomal-dominant benign form (osteopetrosis tarda), which occurs in adults. Autosomal-recessive osteopetrosis (ARO) is a life-threatening condition, which classically manifests in the first few months of life. 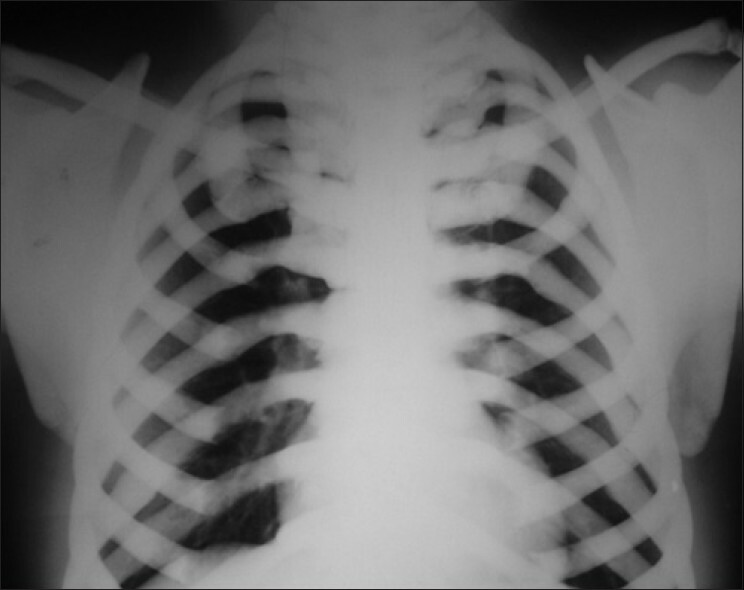 Seventy-five percent of the patients with infantile osteopetrosis die before the age of 6 years, mostly due to recurrent infections, especially pneumonia or osteomyelitis complicated by septicemia. Genetic testing can be used to confirm the diagnosis and differentiate between different subtypes of osteopetrosis. Routine dental surveillance and maintenance of oral hygiene form an integral part in the management and play an important role in preventing more severe complication such as osteomyelitis of the jaws. Osteomyelitis secondary to osteopetrosis can be treated with antibiotics, sequestrectomy, saucerization, decortications, resection of the jaw and hyperbaric oxygen. Dietary calcium restriction and high-dose calcitriol have been used to stimulate host osteoclasts to resorb bone. High-dose corticosteroids, erythropoietin and parathyroid hormone can improve hematopoiesis and boneresorption. Diagnosis in the present case was based on radiographic findings that showed a generalized increase in the density of bone. In conclusion, as oral diagnosticians, knowledge of the manifestations of the various systemic conditions associated with osteomyelitis is essential. 1. Scully C, Langdon J, Evans J. Marathon of Eponyms: 1 Albers-Schonberg disease (osteopetrosis). Oral Dis 2009;15:246-7. 2. Stark Z, Savarirayan R. Osteopetrosis (review). Orphanet J Rare Dis 2009;4:5-16. 3. Langlais RP, Langland OE, Nortje CJ. 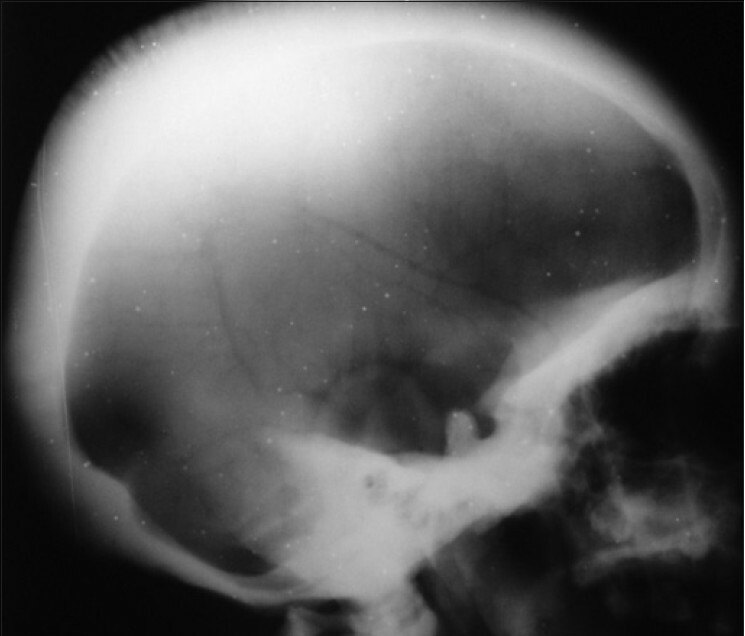 Generalised radiopacities: Osteopetrosis. In: Langlais RP, Langland OE, Nortje CJ, editors. Diagnostic imaging of the jaws. Malvern, USA: Williams and Wilkins; 1995. p.598-613. 4. Anderson PE, Bollerslev J. Heterogeneity of autosomal dominant osteopetrosis. Radiology 1987;164:223-5. 5. Superti-Furga A, Unger S. Nosology and classification of genetic skeletal disorders: 2006 Revision. Am J Med Genet Part A 2007;143A:1-18. 6. Barry CP, Ryan CD, Stassen LF. Osteomyelitis of the maxilla secondary to osteopetrosis: a report of 2 sisters. J Oral Maxillofac Surg 2007;65:144-7. Sharma, S.S. and Saravanan, C. and Sathyabama, V. and Satish, C.
Navarro, D.M. and AcuÃ±a, J.G.S. and DÃ¡valos, C.P.